Diabetic retinopathy is a complication of diabetes that affects the eyes, specifically retina which is situated at the back of the eyes. This can develop in anyone who has type 1 or type 2 diabetes mellitus. 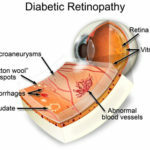 At the early stage of the disease, diabetic retinopathy may cause no symptoms or just mild vision problems. Eventually, this condition can lead to blindness. This is more especially true for patients with uncontrolled blood sugar levels. 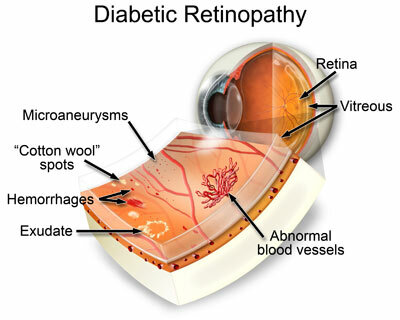 Diabetic retinopathy usually affects both eyes and is generally asymptomatic at first. As the condition advances, patients may experience symptoms such as blurring of vision, fluctuating vision, distortion, spots or dark strings floating in your vision – floaters, and eventually loss of vision. Microaneurysms – early sign of diabetic retinopathy; these appear as small, red dot in the superficial retinal layers secondary to capillary wall outpouching due to pericyte loss. In this type of retinopathy, retinal blood vessels weaken. Microaneurysms protrude from these vessel walls of the smaller vessels, sometimes leaking blood and fluid into the retina. Dilation of the larger vessels occurs and becomes irregular in diameter. As more vessels become blocked, nonproliferative diabetic retinopathy can progress from mild, moderate to severe. Mild NPDR is characterized by the presence of at least 1 microaneurysm. Moderate NPDR is characterized by the presence of microaneurysms, hemorrhages, and hard exudates. Severe NPDR follows the 4-2-1 rule which is characterized by microaneurysms and haemorrhages in 4 quadrants, presence of venous bleeding in at least 2 quadrants and intraretinal micrvascular abnormalities in at least 1 quadrant. The hallmark of the disease is neovascularisation. 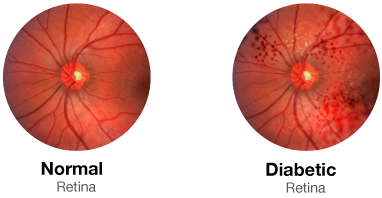 Other signs of PDR are fibrovascular tissue proliferation, preretinal hemorrhages, macular edema and traction retinal detachments. Anyone who has diabetes can develop diabetic retinopathy, however risk of having this condition increases for patients who are of black, Hispanic or Native American race; pregnant; tobacco use; patients with high blood pressure, high cholesterol, poor control of blood glucose level and depends on the duration of being diabetic. The longer you have diabetes, the greater chance of you developing the disease. Test for diabetic retinopathy is best being done with eyes dilated. Drops are placed in your eyes to dilate your pupils allowing your doctor to get a better view inside your eyes. The drops may cause your close vision to blur but this effect subsides later on. Upon examination, your doctor will look for any swelling, blood or fatty deposits in the retina, abnormal blood vessels, retinal detachment, neovascularisation, scar tissue, bleeding in the vitreous and optic nerve abnormalities. At the same time, your eye doctor may test your vision, look for evidences of cataracts and measure your eye pressure to test for glaucoma. Fluorescein angiography wherein the doctor takes pictures of the inside of your eyes while your eyes are dilated. After which the doctor will inject a dye into your arm and take ore pictures as dye circulates through your eyes. Microaneurysms appear as pinpoint, hyperfluorescent lesions in the early phases of the test and typically leak out as the test goes on. Optical coherence tomography provides cross sectional images of the retina showing the thickness of the retina and selling within the retina which will help your doctor determine whether fluid has leaked into retinal tissue. This can also be used to monitor how treatment is working later on. 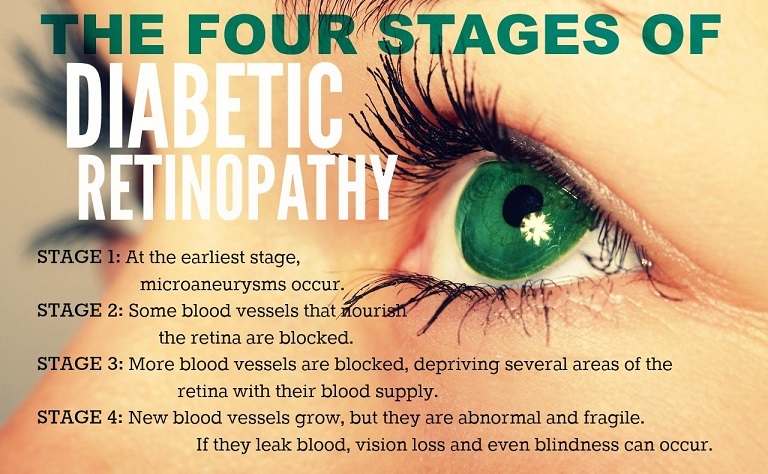 Diabetic retinopathy if left unattended can lead to serious visual problems such as retinal detachment, vitreous hemorrhage, glaucoma and eventually blindness. 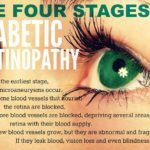 Depending on the type and severity of diabetic retinopathy, your doctor may suggest treatments gearing towards to slowing down or stopping the progression of the condition. During early diabetic retinopathy, good blood glucose level control can usually slow the progression. This may not need treatment right away however close follow up with your doctor will help your doctor determine when you might need treatment. Focal laser treatment – also called as photocoagulation. This procedure treats leak from abnormal blood vessels with laser burns which can slow down or stop blood and fluid leakage in the eye. Scatter laser treatment – also called as panretinal photocoagulation. This procedure treats areas of the retina away from the macula with scattered laser burns causing abnormal new blood vessels to shrink and scar. Vitrectomy – This procedure is done in a surgery center o hospital using local or general anesthesia. This is done by putting a tiny incision in your eye to remove blood and scar from the vitreous. Favourable prognostic factors include well defined leakage, good perifoveal perfusion and recent onset of circinate exudates. Unfavorable prognostic factors include macular ischemia, hypertension, diffuse edema, lipid deposition in the fovea, and preoperative vision of less than 20/200.